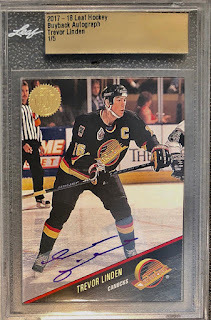 MY HOCKEY CARD OBSESSION: LINDEN CARD(s) OF THE WEEK - Bought 'Em, Got 'Em, Where Am I With 'Em? LINDEN CARD(s) OF THE WEEK - Bought 'Em, Got 'Em, Where Am I With 'Em? Well I can safely say that the start of 2019 has proved to be far more exciting from a hobby standpoint than most of my 2018. I've already surpassed my blogpost amount from the previous campaign and I've picked up a few quality pieces for my growing projects. The staple of them all though still remains my Trevor Linden collection. I took some time over the holiday break to go through my Linden cards, do a little resorting, double check some lists and just enjoy the cards I've been chasing for over 20 years. It really reinforced to me how much I enjoy this project and how I really feel like I've come into my own with how I approach this daunting task. He's got a lot of cards on the wantlist, and a good chunk of them are both tough to find - and costly. A patient approach while waiting for the right price is key. Which brings me to my two latest acquisitions. I'm on the fence with them. The word that comes to mind is.....gallimaufry. I believe Paul over at Card Boarded has used that word a few times. This card has a lot going on. First of all, the blue foil pops - a lot......and it looks awesome. It really makes the card look crisp. The patch is big - real big.......and I love the three colours with the stitching. It's a solid, super, patch. But this is where the train derails a bit. The jersey in the photo is one Trevor never wore (flying V) and I don't quite get why a Canucks jersey was used on a card with a Canadiens patch? It really makes a colourful mess on the front of the card. I didn't pull the trigger right away when I saw this piece, yeah it's rare (only four copies) but I just didn't feel "excited" to hit the purchase button. I don't feel like I overpaid.....but I feel now that I could've held out longer and picked one up for less eventually. Regardless, it's a nice enough card and I am excited to add it to the collection. Just not "over the moon" excited. This base card buyback auto thing has now hit me a few times - and the novelty of it is growing tired. Back in 2010, it was Panini offering up the Score Recollection Collection buyback autos. Those were fun to snag. A little pricey considering it was a penny base card with an auto and a serial number stamped on it. In 2016, Upper Deck got into things with their Fleer Showcase 25th Anniversary Buyback autos. Again, a nice idea, and well executed. This time they were a little more common (25 copies) and so the chase....and find was fun. This time around it's Leaf, and really it's not pushing any boundaries. In fact, I feel like they've taken a bit of a step back by putting a sticker signature on the card. It just doesn't have the personal connection that the others did. Nonetheless, when they started to pop up online, I kept my eyes open. The first few came and went......and came again, and again. The prices were just too high - for me and many others it seemed. Finally, this copy popped up (from a seller I've dealt with numerous times over the years) and while I thought the price was a little high, I thought it was more in the ballpark. I made an offer and they accepted. So I should feel excited right? I got the card for the price I wanted to pay.....right? Yeah, the "over the moon" feeling just wasn't there again. Much like the Super Patch, this card is just....there. Again, don't get me wrong, I love the fact I've added it to the collection. I just don't feel like I've snagged a sweet deal or landed an amazing item. Two solid pieces.....that's where I am with 'em. I like buyback autographs... but I don't get overly excited about low #'d cards. To me it's about the card itself. 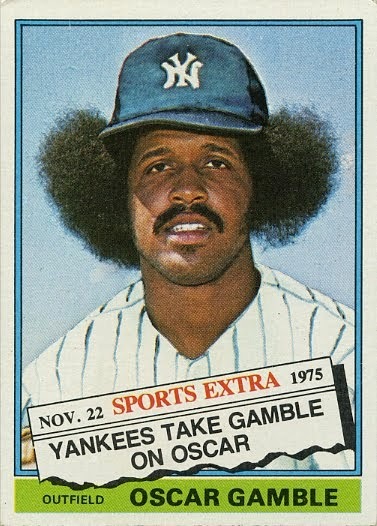 I'd much rather have a card I find attractive signed and numbered to 200, than an unattractive autograph numbered to 5. 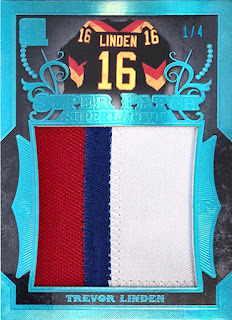 As for getting a swatch of a jersey that doesn't match a card's photograph... well... that's just silly (imho). But at the end of the day, both of these are pretty heavy duty Linden pickups. Congratulations! Nice to see the word 'gallimaufry' worked into a post like this. Definitely understand the feeling about that patch card. Something is just feels wrong about it. Cards with jersey pieces that obviously don't match the photo on the card like that could make for a fun side project.